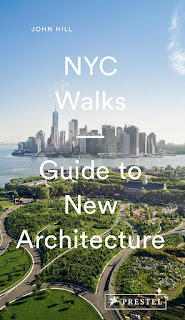 Research for my guide to contemporary architecture in New York City includes the fairly obvious reading of other architecture guides, be it NYC or some other city. But of course these sort of guides offer an incomplete view of the city, so my research extends to other takes on the city in print form. Jon Cotner and Andy Fitch's short book focused on Manhattan is as far removed from architecture guides as can be, but it helps instill what is too frequently missing from books on buildings: the experience of the city. The book, as is immediately apparent, takes the form of ten walks and two talks, "updates [on] the meandering and meditative form of Bashō's travel diaries ... a descriptive/dialogic fugue." 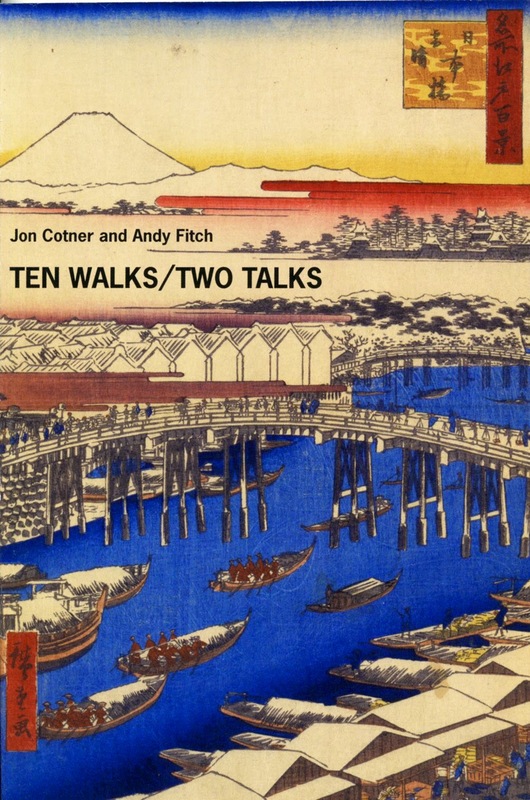 Fitch pens the ten walks and the two authors' interaction becomes the two talks. For me the ten walks stood out for their stream-of-consciousness descriptions of almost everything within eye, ear and even nose shot, those things that become background for New Yorkers. "Fingers peeked from a homeless person's quilt. ... The fresh morning smell had changed to damp boots." It is as if the blurred edges achieve the clarity of what is actually being focused upon, like the Hiroshige prints that accompany the text; the detail of the horses' hooves is as important as the shop fronts. Cotner and Fitch's two talks -- in Central Park and in Union Square's Whole Foods -- present a similar take on the city, somewhere between the external reality of it and the internalizations made up of past experiences. The dialogue form includes the stops, starts and interruptions that come with natural conversation, making me long for an audio companion. (Perhaps a visit to Unnameable Books on March 16 for a reading by the two is in order.) In both cases -- walks and talks -- a certain patience is required to fully appreciate the intricacies of the language and structure instilled in the text. (It is no accident the book is categorized primarily as poetry.) But even a cursory reading offers much to appreciate, a subtle shifting in the way one experiences the city. New York is the ultimate walker's city, a melange of objects and people interacting in unique and unpredictable ways. 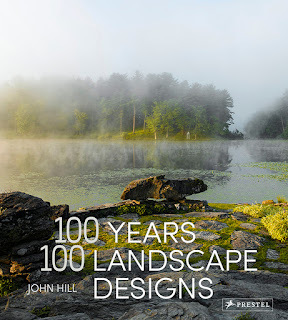 This book is a great "guide" to this aspect of the city.